The founder of the Ringling Brothers Circus. A clown in the Cole Brothers Circus. Don't go antiquing without this valuable book. Find the value of what you own in seconds. Identify your collectibles with today's pricing. Share this page with your friends using the buttons provided with each article. By the late19th Century, working and middle class Victorians, with more free time on their hands, sought out ingenious, yet affordable modes of home entertainment. One such home entertainment device was the roller organ, a type of table-top music box that played wooden rollers called cobs because they resembled an eaten cob of corn. Although roller organs came in different sizes and degrees of luxury, the most popular one was the "Gem" Roller Organ, manufactured by a number of companies, including the Autophone Company of Ithaca, New York. Originally, these hand-cranked organs operated by air pressure from exposed bellows, As technology improved, later models worked by vacuum pressure, thus enabling manufacturers to reduce the size of the units, much as today’s technology has reduced the size of radios and cassette tape players. Because of its relative simplicity, manufacturers produced tens of thousands annually, thereby keeping the cost of a roller organ affordable. Sears & Roebuck, in their 1902 Catalog, was able to offer the Gem Roller Organ for as low as $3.25, including three rollers. Contracting with companies to produce large quantities of these devices enabled Sears to sell in volume and keep its price low. The Gem Roller Organ, available in either a painted black or walnut-like finish with gold stenciled applied designs, used teeth or pins embedded into a 20-note wooden roller, similar to the cylinders used in Swiss music boxes. Pins operated on valve keys while a gear turned the roller. Priced as low as 18 cents each–and according to the Sears Catalog, less than traditional sheet music–roller music ranged from classical to sacred to ethnic and popular tunes. The tone was similar to a cabinet parlor organ of the time. At 16 inches long, 14 inches wide and 9 inches high, the Gem Roller Organ was small and light enough to place on a parlor table. The 1902 Sears Catalog listed 220 different rollers of the over 1,200 different titles available. To understand just how much the value of the Gem Roller Organ has appreciated, Sherrill and Barb Edwards of West Grove, PA recently priced one at $850 at an antique show in Pennsylvania. 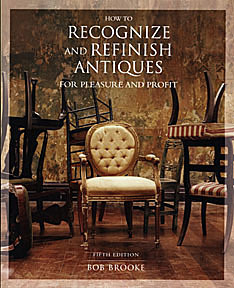 An occasional feature about caring for your antiques and collectibles. A new feature showcasing outstanding museums where you can see unusual antiques.